The eleventh annual SXSW Pitch Presented by Cyndx takes place in front of a live audience and panel of expert judges to discover advancements in various sectors of emerging technology. The eleventh annual SXSW Pitch (formerly SXSW Accelerator) Presented by Cyndx will take place at the Hilton Austin Downtown (Salon DE, 4th floor) on Saturday, March 9 and Sunday, March 10. A live audience, as well as a panel of expert judges, will discover advancements in various sectors of emerging technology at this SX event. The best part – product demonstrations by the most ambitious talents in the world with the creative new ideas to change it. Catch a glimpse of the industry’s future, with a guided tour by our emcees and judges. 2019 SXSW Pitch will feature 50 interactive technology companies from 10 different categories. Browse the full list of 2019 Finalists and Alternates. These companies will dazzle a live audience with their company pitch and Q&A with our panel of judges. We will feature 25 companies on Saturday, March 9 and 25 companies on Sunday, March 10 at the Hilton Austin Downtown (Salon DE, 4th floor) – add SXSW Pitch events to your SXSW Schedule by category. On Sunday, March 10 at the Hilton (Salon H, 6th floor) at 6:30pm, we will host the SXSW Pitch Award Ceremony and announce a winner from each category. On Monday, March 11, get to know the finalists at the SXSW Pitch Finalists Meet Up at the Hilton (Salon C, 4th floor) from 11:00am-1:30pm. Download the 2019 Report from PitchBook to explore 11 years of SXSW Pitch data including industry categories and standout alumni stats from the most VC capital raised to most active investors in SXSW companies and much more. Cyndx is the leading investment search platform which utilizes predictive analytics to intelligently power fundraising processes and M&A activity. Leveraging artificial intelligence (“AI”) and advanced semantic processing technology, the platform analyzes global investor and market data patterns, to make it faster and easier for investors and companies seeking capital and investment opportunities to find each other, every time. The Google Cloud for Startups Program supports startups at their earliest stages. Through the program, companies gain access to Google product discounts and cloud credits, technical training and support, and a thriving community of founders and developers globally. Eligible startups can join today and start building and scaling with the same infrastructure and tools used by Google. SXSW Pitch proudly applauds our alumni and the millions of funding along the way. Over the years, we launched our startup platform for finalists with great ideas with the goal of matching them with top investors both nationally and internationally. From our inaugural year of 23 participants to a total of 453 through 2018, we are proud to be the catalyst of many dreams and successes. Some of our prestigious alums you may know include Klout, Hipmunk, Wildfire, Siri, TubeMogul, Foodspotting and Tango. Does not include certain undisclosed funding. This data is as of May 30, 2018. Explore the Past Winners Archive to browse winners and other participants from previous SXSW Pitch seasons. 1.3M people die from crashes every year. Autonomous Vehicle technologies are coming, but “mute” autonomous systems won’t solve all safety problems. Derq, an MIT spin-off and Techstars Mobility alum, develops software that helps eliminate crashes and save lives by using patented and award-winning AI algorithms to predict crashes with enough time to prevent them. Healium by StoryUP is the world’s first XR mindfulness channel powered by the user’s brain and heart rate. The biometrically controlled VR & AR stories heal themselves via data from the user’s wearables. In published studies, Healium has been shown to reduce moderate anxiety in as little as 4 minutes. Nebula Genomics offers consumers and patients affordable personal genome sequencing and enables control over personal genomic data, while researchers get access to a network of individuals for on-demand genomic data generation, access and analysis. Geospiza uses big data analytics to save lives in disaster. We automate data integration and provide rich, evidence-based decision support to emergency managers, elected officials, and corporate continuity planners. Tankee helps parents protect their kids from inappropriate online content while allowing kids to watch gaming videos they love on mobile devices. From Minecraft adventures to ROBLOX music videos, Tankee’s team of real live humans review, create, and curate the best gaming content in a family-friendly, worry-free environment. Pathware is creating hardware and software solutions to simplify the digital pathology workflow. Our whole slide imaging and cloud-based management system, Bioptic, rapidly returns a biopsy quality determination to verify that a viable biopsy was collected with over 96% certainty. UbiGro is a nanotech-enabled greenhouse film by UbiQD, Inc. that red-shifts the sun’s spectrum for improved crop yield and quality. UbiGro has been shown effective for tomatoes, cucumbers, leafy greens, hemp, and cannabis in various climates. UbiQD enabled this innovation with its safer, cheaper, and more reliable quantum dot technology. Supportiv —The Support Network—delivers NLP-driven precision peer support and hyper-targeted resource recommendations for daily life struggles like work stress, family pressures, relationship conflict, or loneliness. The proprietary NLP instantly matches users into topic-specific peer groups that dynamically convene for real-time emotional support. People healing people, globally scalable. Miro uses AI & computer vision to instantly identify athletes, individual consumer insights & more from running event photos/video. Miro analyzes the human body in motion to unlock value for athletes, events, sponsors & brands. Miro’s proprietary AI has powered the raceday experience for more than 7MM athletes globally. ENSO innovates in the tire industry by making sustainable tires for electric vehicles that fundamentally reduce toxic tire emissions and increase EV driving range up to 20%. ENSO’s eco-friendly tires are significantly more sustainable and energy efficient than the standard tires currently equipped on some of the World’s best-selling EVs. Showcasing cutting-edge technology in a global startup space – 50 finalists from around the world will pitch to a panel of judges and a live audience this March 9-10, 2019 in Austin, Texas. Watch our video to hear from past participants and preview what to expect for 2019! SXSW Pitch Awards Ceremony presented by Cyndx is where you can see the world’s top startups that have emerged as the best of the best at the 2019 SXSW Pitch Event. After two days of pitches, our judges will select a winner from each category. The ceremony is held on Sunday, March 10 from 6:30pm-8:00pm at the Hilton Hotel (Salon H, 6th floor). Andrew is a technologist that has roots in design. He started Startup Weekend which reached half a million participants and 162 countries around the world. He runs a nonprofit helping build community around the world. Lisandra Rickards is Chief Entrepreneurship Officer at the Branson Centre of Entrepreneurship – Caribbean, the region’s leading business accelerator for scale-up entrepreneurs. Rickards has developed and delivered scaled initiatives to over 2,500 Caribbean entrepreneurs and counting. She has also spearheaded the Centre’s strategy to support growth stage entrepreneurs towards investment raised funding for the expansion of the Centre’s mission, and relocated its headquarters from Montego Bay to the business hub of Kingston. She holds an MBA with Honors from Harvard Business School. 25 companies will be featured on Saturday, March 9 and 25 companies on Sunday, March 10 at the Hilton Austin Downtown (Salon DE, 4th floor). Add SXSW Pitch events to your schedule by category below. Technologies related to simulation of intelligent behavior by machines, a machine’s capability to improve and perform tasks on its own. These startups seek to address medical diagnosis, remote sensing, electronic trading, transportation, tutoring, speech and visual recognition, and many more on the subject. Technologies using augmented reality (AR), virtual reality (VR), robotic automation and other novel visualization technologies, including applications for Cardboard, Oculus Rift, and other emerging offerings from industry giants. These applications may address such uses as gaming, entertainment, data visualization, education, medical care, warfare, transportation, and many more subject. Technologies using digital ledgers, decentralized internet, and other distributed applications as ways to structure and share data. These applications may address such uses as cryptocurrency, supply chain, energy, media, global trade, security, and numerous other industries. This category showcases new products, services and apps that help hyper-connected communities (such as what occurs on-site at SXSW) better navigate and maximize their engagements. 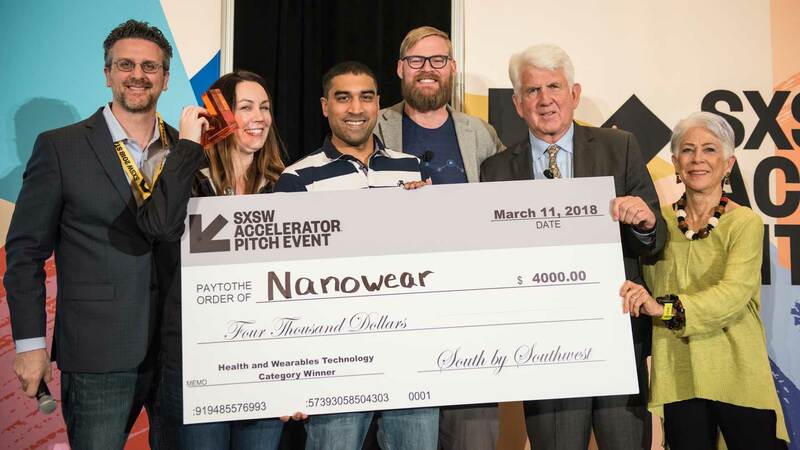 In addition to the kind of technologies that thrive in March in Austin, this category is for any creative and innovative app, product or service that does not fit elsewhere in the SXSW Pitch lineup. Examples of technologies that might fit into this category include (but are not limited to) Internet of Things, energy, space, natural resources, agriculture and robotics. Testfire Labs is an award-winning software company that uses machine learning and artificial intelligence to build next-generation productivity tools. Our flagship product is Hendrix.ai, an AI-assistant that transcribes notes and action items, audits meeting history, and drops it all into a searchable dashboard, for unprecedented organization and productivity insights. RoadBotics is an infrastructure technology company that uses AI to revolutionize how governments and engineering firms make data-driven pavement management decisions. The company uses cutting-edge deep learning and a simple smartphone to disrupt the highly subjective and expensive pavement inspection process. Imagine you never had to deal with insurance again. Sherpa’s proprietary AI assesses all the risks you face, and builds you a personalised, all-in-one insurance solution. What’s more, our insurance will automatically keep up to date as your life changes, so you can sleep easy, knowing you are always perfectly protected. Insurance reinvented: better, simpler, cheaper. Autonomous livestock farm management. Livestock produce 30% of global protein. Vence reduces the cost of sustainably raised meat by eliminating the need for infrastructure (fences) and labor on livestock farms and giving customers real-time control. Our AI/ML also provides farmers with additional insight into animal behavior, health and fertility. CleanRobotics utilizes robotics and AI to properly sort recyclables and landfill waste, at the bin level, while gathering useful data and educating the public. Track is on a mission to make it easier to be self-employed, starting with automatically detecting 1099 income, then withholding and submitting what you owe. No more tax surprises. XAIN AG is a Berlin-based AI, Cybersecurity and Distributed Systems company. We combine academic research with industry experience to develop unique solutions around enterprise data, resource and knowledge sharing challenges. BehaviorMe has created a SaaS that enables therapists to increase the independence of kids and young adults with autism and developmental disabilities. The software is used as part of a therapy session where therapists can run multiple scenarios during a single appointment. Currently the software is being deployed as a web portal and standalone VR headsets. LinkDyn provides cutting-edge robots that enable new human-robot interaction in VR applications with realistic force feedback, robotic rehabilitation with seamless assistance, and more. The VR Haptic Robot can drastically improve VR training efficacy by allowing users to feel virtual objects and environment like those in the real world. Obsess is an immersive e-commerce platform that uses mobile & web-based VR and AR (no headsets needed) to create a new, highly engaging online shopping experience. Our mission is to re-invent the grid interface that hasn’t changed since it was invented by Amazon 20 years ago to sell books online. DigitalTwin Technology founded in Cologne, Germany aiming to create digital twins of civil infrastructure. Tunnelware is a product that provides digital twin of construction site and Tunnel Boring Machine in order to monitor and manage the construction process in real-time on 5D platform virtually for safer and productive environment. myHouseby is the leading platform for new home construction allowing home buyers to discover, design and build homes for their unique lifestyles. From home plan discovery to designing and creating a new home, myHouseby is revolutionizing the new home construction marketplace. Screen Door Laboratories augments team capabilities with real-time mission-critical information. Using virtual reality technology, Verapy enhances patient experiences through fun exercise games – reimagining the way therapists engage with their patients. Bext360 develops technologies that leverage blockchain, artificial intelligence and IoT, to: streamline critical supply chains in emerging economies, provide a traceable fingerprint for commodities from producer to consumer, and enable organizations to track sustainability and CSR policies and progress. Bext360 was named to Forbes’ 25 Most Innovative AgTech Startups In 2018. Eggschain exists to preserve hope of life and peace of mind in the fertility industry and beyond. Leveraging the blockchain, we enable consumers to track their frozen eggs, embryos, sperm and genetic materials. We deliver the above by providing immutable records of ownership information and estate plans. Knowbella Tech is an open science collaboration company that uses blockchain to deliver free tools, services, intellectual property, and equipment to researchers, particularly the underserved. Those researchers who collaborate within the Platform will be awarded AnthroCoin cryptocurrency. The Company will initially generate revenues by matchmaking scientists with employers who pay to access the scientists looking for employment. SteamChain is unlike any other Industrial IoT company in the market today. We don’t just create dashboards that need to be monitored. We enable new business models that bring purpose to clients IIoT investments by connecting financial transactions to machinery performance. Bioverse is changing the way our society values the natural ecosystem and biodiversity by creating an entirely new economy that leverages biological and genetic diversity. Using blockchain to secure access and ownership of digital genomics and associated IP, Bioverse is creating a mechanism to ensure that investments in biological and genetic discoveries are generating capital gains to indigenous communities, local government, and ecosystem restoration initiatives. Lucidity uses blockchain technology to bring transparency to digital advertising so brands always get what they pay for, honesty is rewarded, dishonesty isn’t, and measurement standards are enforced. We provide the transparency brands need to buy media with confidence. NuID is a pioneer in trustless authentication and decentralized digital identity. The NuID platform leverages zero knowledge cryptography and blockchain technology to eliminate the need for businesses to store passwords. Based on Pilosa, Molecula is a computational analysis engine that enables scientists and engineers to focus on the fundamental research needed to solve complex problems without the expensive and difficult data management usually required. Molecula is shifting the focus to extracting knowledge and intelligence from information. Novo is a banking platform that provides better business checking accounts to today’s companies and is powered by a network of FDIC-insured community banks. Novo is bringing small business banking into the modern age with easy-to-use tools for founders on the go. Osano’s platform utilizes ML to provide users with insights regarding data sharing. TransferFi is creating the world’s first long-range, safe and efficient Wireless Power Network (WPN). It will be used to power IoT sensor networks to high-power applications that will provide easy access to primary sources of energy. TFi is revolutionizing the way we access power. Clovis is the next generation anti-money laundering solution: we’re building AI that stops criminals from using our financial systems to terrorize and exploit people around the world. Research global networks, cloud regions, and interconnected data centers in one place. Acciyo’s mission is to transform reading the news from a survivalist exercise into a rich, motivating experience. Our debut product is a tool that populates a timeline of previous articles published on the subject you’re reading. No matter what you read, get the context you need to understand it with ease. Fantag is the easiest, fastest way for teams, schools, broadcasters and streamers to manage video – for hassle-free sharing of highlights. Using patented cloud video synchronization technology and an app, Fantag automates delivery of personalized highlights and transforms the fan experience. We create a world where no moment is ever lost. Horizon makes blockchain-powered video games for dreamers, futurists, and digital citizens. We’re pioneering a new dimension of gaming that belongs to its players. Stroly is an online platform for illustrated maps linked with geolocation technology. Our service also provides user behavior feedback for data-driven marketing. Ibble helps people build financial confidence by unlocking investment knowledge. With curated news, daily interactive live-streams and weekly trading competitions, we make investing accessible for everyone. Immersive Systems is delivering a media platform to power the next generation of fan engagement and revenue growth in competitive esports. The platform seamlessly integrates all the stats, highlights, images and content that fans want and delivers it in a beautiful, interactive app. Vidgo is a prepaid streaming service that targets the unbanked. Vidgo has developed a disruptive pre-payment ecosystem for television to accept cash paying customers. Boost Biomes is using the powerful social networks among microbes to provide novel, sustainable solutions to feed and heal people everywhere. Our first products seek to reduce the enormous waste in agricultural products due to crop loss to fungal pests in the field and post-harvest. Kegg aims to disrupt fertility industry by cutting of the unnecessary costs, providing meaningful data to women through fertility hardware and access to remote 1:1 fertility specialists. This will make fertility care affordable to millions of women and provide the necessary data for the foundation of preventive healthcare. X-Biomedical is commercializing surgical visualization technologies developed over several years at the Children’s Hospital of Philadelphia. Our novel all-inclusive portable surgical visualization solution is at the convergence of multiple enabling digital technologies & provides more value & costs significantly less compared to status quo systems, disrupting a ~$2B market. Zibrio: The balance company is dedicated to giving people an edge in their performance, and preventing unnecessary deaths, injuries and costs from falls through a connected smart-scale that measures balance and identifies fall risk. Falls are not a normal part of aging, and we give you the health span you crave. InvestAcure, PBC is building a spare change investment platform to help you invest in companies working on a cure for Alzheimer’s. Our vision is to see a world where drug companies are owned by millions of spare change investors committed to a cure. Rhaeos is a noninvasive wearable flow sensor designed by Northwestern University materials scientists and neurosurgeons for the care of patients with hydrocephalus. Using smart speakers to make smarter exercises for Parkinson’s, Triad Health AI takes advantage of emerging smart speaker ecosystems to help people living with Parkinson’s stay healthy, safe and independent. Mesh++ builds battery- and solar-powered WiFi nodes that can host huge, high-speed mesh networks anywhere. NODE’s patent-pending technology and platform makes the most sustainable and healthy homes affordable. We slash time and cost by turning construction into assembly, activating a new workforce to assemble our flexible system that results in high quality, zero emission, homes. ObjectBox enables Edge Computing in IoT and Mobile with the fastest Edge Database: smaller than 1MB, 10x faster than any alternative, and easy natural language APIs. With ObjectBox, companies develop decentralized products independent from the cloud, that perform in real-time. On top of the database we‘re building a synchronization solution. TwentyTables re-imagines the relationship between patrons, restaurants and the food insecure. Our multi-sided marketplace offers consumers affordable fixed-cost meals, and increases vendor efficiencies, while also helping feed the hungry. A-Community-of-Food. Fieldcraft is a sourcing platform harnessing better data so buyers can simplify ingredient discovery and leverage plant-based and clean label solutions for the next generation of food and beverage. We make it easy for people to take checkbook control of their retirement savings and invest in anything allowed by the IRS, with no penalties. EnrichHER Funding is fueling the growth of women-led businesses by enabling women founders to secure capital in an affordable and non-dilutive way. Similar to Kiva, we provide investors with an opportunity to lend to small businesses. EnrichHER loans range from $50,000 to $75,000 and are made to pre-screened women-led companies. MySideKick is a complete web-based application that addresses all the issues of sexual violence, with a mobile interface to help better engage college students. We discovered 4 reasons why sexual violence is not properly being addressed on college campuses and created 7 powerful components to address and remedy these issues. At New Age Meats, we make meat from animal cells instead of animal slaughter. We can craft meat to be tastier, healthier, and more sustainable than any other meat. VOLO Group is transforming career development to help people build happier, more fulfilling careers. Their Career Volunteering platform offers a differentiated approach to professional development that addresses skill-building through volunteering; offering hands-on opportunities to learn and grow, while making a positive impact in the local community. Explorest is modernizing how people discover, experience and photograph the world’s greatest places via highly curated insights from today’s top travel influencers. A lifestyle application to allow users with mobility impairments to access life! Tris started as a search and chat extension for google, talk to others searching the same thing, now we are a social browser in play store and App Store. Bisecu, world’s first fully automatic smart bike lock. Bisecu, which allows bicycle users to forget the presence of the lock and enjoy the bike riding experience fully. Bisecu is not only a completely new type of lock but also the lightest smart bike lock. Furthermore, Bisecu acts as a smart cycling device that analyzes users riding data. We are a sports technology company with our first product, CricFlex – world’s first wearable technology for Cricket. An arm sleeve, embedded with sensors, tracks illegal bowling actions, arm force, action time & spin to determine player performance, consistency and effort, helping them improve. It’s a US patented technology. The FCFL is reimagining sports for the digital age: taking the passion of live sport, the competition of fantasy sports, the engagement of video games, and the global reach of esports and combining them into a fan-controlled, live sport, streamed on Twitch and built for the next generation of fan. Learn2Play is an international eSports EdTech company offering gamers a platform to improve their skills. L2P counts with over 1M subscribed users on its two platforms, MoreMMR and MoreLegends, which make use of AI to provide a match analysis for Dota 2 and League of Legends, respectively. The platforms also counts with video lessons and its own tournaments. Mobalytics is the first personal performance analytics platform and gaming assistant for gamers. The platform measures player performance, helps them define their strengths and weaknesses and provides personalized advice on how to improve. You can think of it as an AI coach for gamers. Uru Sports is an online sports recruitment platform connecting players, coaches and teams. Athletes use Uru to find available roster positions on teams worldwide. Teams use Uru to recruit talent. Xplosion Technology is a sports-technology company based in Texas and centered around our cutting-edge human performance software platform. Think Google Analytics for athletes. Our state of the art, patented data collection process prevents and identifies key injuries among players. Xplosion leverages validated testing methods coupled with wearable sensors to provide training staff comprehensive reports about each athlete’s susceptibility to injury. Electristructure is an infrastructure developer for electric charging stations focused on public transport buses. The market for electric buses in public transport is experiencing a major breakthrough this year. Electristructure will take responsibility for long-term investments and optimization of public transport systems. Migo is the free app for discovering new and existing ways to get from A to B without jumping from app to app. Migo helps riders discover the right ride, at the right time. Options include rideshare, carshare, taxi, scooter, and bikeshare, to specialty transport and public transportation. CargoX is the first open, neutral, and independent decentralized blockchain platform for the shipping industry, built with CargoX’s Blockchain Document Transaction System (BDTS). Freight forwarders, platforms exporters and importers can now enjoy superb data security, documentation transaction speed, and comprehensive integrity with CargoX’s revolutionary Smart Bill of Lading. Kaizen Health is changing mobility for healthcare and municipalities to ensure every person, regardless of physical ability, has access to transportation that they need to lead healthy and happy lives. Kilroy Blockchain helps innovators disrupt their industries by specializing in building custom integrated systems using blockchain, artificial intelligence, and ecommerce technology to streamline business processes and create a smarter organization. Millebot is a privately held deep-tech company that designs and builds a modular digital-manufacturing platform within the ISO shipping container. Our mission is to accelerate access to sustainable production. SXSW Pitch Event Producer Chris Valentine explains the value of this fast-paced pitch competition. PitchBook, a financial data and software company, has complied a decade’s worth of data into a report for SXSW Pitch Presented by Cyndx. Download the 2019 Report from Pitchbook below to explore industry categories and data on standout, past participants from the most VC capital raised to most active investors in SXSW companies and much, much more. SXSW Pitch relies on hand-picked judges, qualified to determine the viability of a startup based on their demonstrated business and investment experience. The judging process will determine which of the finalists has the most innovative product or service. The following individuals have agreed to contribute their expertise toward the success of the 2019 SXSW Pitch event. 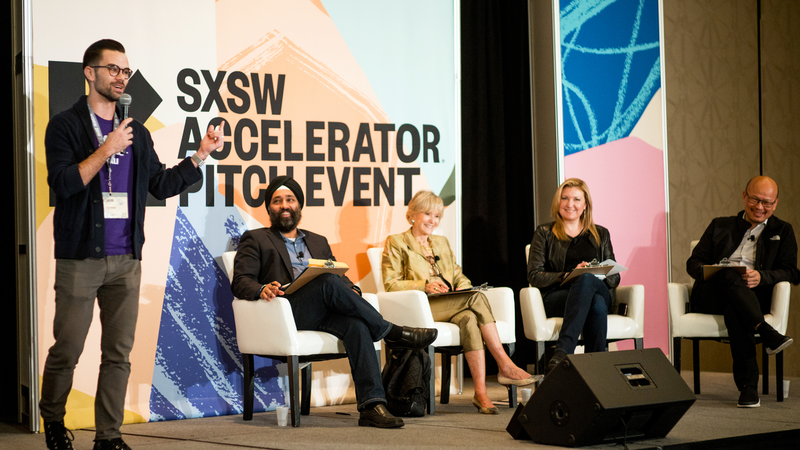 Each year, the SXSW Pitch Advisory Board lend their industry expertise as they evaluate hundreds of applications and help determine the companies that will present in March. These individuals are instrumental to the success of the event, and their hard work, diligence, and support in bringing together the future of the technology industry to our event is greatly appreciated. Explore the 2019 Advisory Board below as well as the Qualifying Committee, Coaches and On-Site Coaches. The Qualifying Committee focuses on the intake of all plans submitted and is responsible for the validating the applications for accuracy, completeness, veracity and proper categorization. With their vast experience, Coaches work closely with the finalists in the months leading up to the event to assist them in their onstage presentations. On-site Coaches work with the finalist as they rehearse their presentation on Friday, March 8, 2019.